This Homemade Thanksgiving Turkey Cake was inspired by the pictures I’d seen up on this site. I was afraid I could not do this but the other submissions really inspired me. I started with yellow cake mix and Duncan Hines cream cheese frosting on the inside. I got the oval shape by using a football pan and made two layers. After icing them I put them together. Iced the outside and laid brown fondant over it the top. Then I had painted and covered it with napkins to give it texture. Once I got the body prepared I put it in the freezer while I had painted the legs and the wings. For the legs I used round cake pans and carved away. For the wings I literally winged it! I had left over cake and just started cutting away. Once I was finished carving I wasn’t satisfied with the wings at all. After I covered the wings with fondant and placed it next to the cake, the cake came alive. The wings really made all the difference. By the way the lemons and cherries are real. I took this to work for a pot luck birthday and everyone loved it. I hope you enjoy! That has to be the MOST realistic cake I have ever seen. 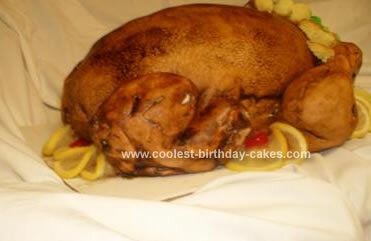 If I would have seen just a picture there is NO way at all I would have thought this was a cake. The wings and legs are amazing. You could have your own business with something like this. Seriously impressed! Outstanding! Looks like the real thing! very nice keep up the good work, you just inspired me to try my 1st one how about that….